Also torn, are today's new templates. They are available in my Kreative Design Studioon Etsy and in the Scrappy Sistersshop. Super for masculine, modern or any kind of theme you want to scrap. Don't forget that our templates can easily be used to design cards and other printable projects that you've got in mind. Simply change the size of your canvas, if you are working with PSE, select all of the layers and use the corners to bring in all of the layers to fit your new page. Check out the pages we've designed using I'm Torn templates. The ladies did such a beautiful job with these fabulous templates, don'cha think?! This is your new, free, printable calendar for August. I just love the photo, too. I got it from Pixabay. They have all kinds of graphics and photos for FREE. You're also getting an exclusive look at my Soak Up The Sun kit that will release next week. The image is linked up to the download. Just a few more months to go! If you are a newsletter recipient of the Scrappy Sisters newsletter, then you received this free template last week. Whoo hoo! If you haven't signed up yet, click on the preview, below and scroll down tot he bottom and sign up. hat better way to enhance your digital stash then with Commercial Use? I get a lot of mine from Just Jamiee and Mommyish. They have a subscription club over at the Lily Pad and they offer freebies every month as well. These were the last two freebies. Styles, actions, papers, brushes, elements....see if there is something for you. I've got reason number #24 for you. "I love that we can trust each other." That's pretty darn important and not always easy to do. Certainly worth making this album. Go to this blog for Reasons 1-27 and the blank cards. I took this digital template and turned it into a traditional page. The template is still freeon my old blog. You might love it over there, too. I had that blog for many years and it's full of fabulous free stuff and all kinds of scrappy projects and pages that will most definitely inspire you. I have not forgotten that free mini album template from a few weeks ago. Find it here! Start thinking what you're going to scrap with it and get a plan. You can always join in on scrap-a-licious fun in our group on FB, Instagram and our Pinterest could have you scrapping and crafty for years with all of the inspiration we've got over there. Thanks so much for stopping by The Cherry. We got new, artsy templates for you, a bit of inspiration and a look at a few new products from your favorite designers in DigiLand. Sometimes simple is better. Especially, when you want your photos to be the main feature. Artsy pages also look great for manly, teenage or boy themed pages, too. I'd certainly think of just the right kit to go with templates like these. Matching up templates and kits isn't always easy. Choose your elements carefully and consider that artistic style templates are typically modern and sparse in their aesthetic. Personally, I dig bright colors with my artistic templates. Black and white or largely black and white can give a great effect, too. Of course, there are NO rules when it comes to art. Feel free to express yourself as you wish. This is me and I used Aimee Harrison's Oceana collection for my update profile and wall photos for my FB account. Perhaps you just like the matting and photo spot of the templates. Those would really go with any kit at all. The journaling is really just to give you an idea of what might look cool and where you could place it. Here is another page I did and I really love the way it came out. I used Throwing Some Scraps Around new, revamped kit, Beach Lover. That textured paper and the blue paint streaks give this page a lot of touchy feely vibes. Of course, the photos colors and those of the kit go pretty well together as well. This gives your pages an incredibly cohesive look. This is another page I did with the Free Time templates. I used a really fun kit from Kristin Cronin Barrow. You can find her goodies at the Sweet Shoppe. More pictures from our trip to Spain. We've got some pretty floral stamps for you on Sunday's blog and of course reason #23 from our on going 52 Reasons Why I Love You. I recently found this site that provides all kinds of printables as well as a few free ones. Of course Paper Craft always has super free, printables too. My Memories Blog Train has also left the station. Hop around and grab the digital scrapbooking freebies. Click on Snickerdoodle's lovely preview and you'll get to the list. If you are looking for more freebies from The Cherry specifically, our blog is full of them and ourprevious bloghas even more. You may want to follow our board onPinterestthat is dedicated to our freebiesand of course we've got a lot of other boards with all kinds of awesome free stuff plus! We share links to freebies everyday on our pageand in our groupon Facebook as well. We'd love to have you join us. Here's one of the more recent free templates from us. "I love when you are thoughtful." If you are just joining us and need all of the cards,click here where you can find all of the links. I want to leave you with an older mini album project that includes a free template and full tutorial. I posted a special edition on Sunday. I'm part of the Pixel Scrapper Commercial Use blog hop. Click here to check out that blog and grab the new freebie. I'm so thrilled you stopped by. I just love scrap-a-licious hops like this one. So many fabulous goodies to try out. I really love stamps and I love flowers and all things floral, too. I designed these stamps for today's train. They would look great as an anchor for a cluster or maybe a paper design? You decide how you'd like to use them and enjoy. I've got a couple of other Commercial Use goodies in my shop at Etsy, Kreative Design Studio, though templates are my thing. My most popular items are my Friendly Frames and Photo Reel templates. They might be just what you are looking for. I've used these digitally and traditionally. They are super versatile. Here was my hybrid project with the mini reels. I've got a full tutorialon how you can scrap one up like this with our templates. If you are all about the free stuff, then The Cherry should be your go to stop. We post freebies every single day in our scrap-a-licious groupon FB and our page. Friday's are dedicated to freebies around DigiLand as well. Take a look at what he had last week. Thanks again for popping in. We hope you do it, again! Here's the link to get back to the Pixel Scrapper. Grab a cup of Jo or something else you love and get comfortable. 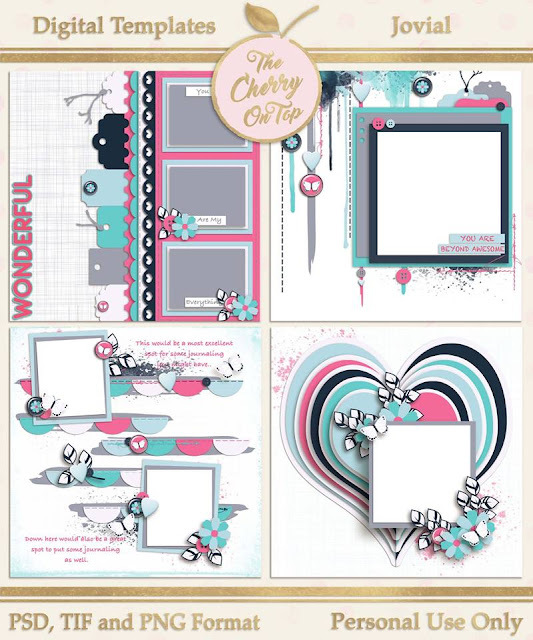 We've got some serious scrap-a-licious pages to show off with our new templates, Choose Joy as well as other pages from my favorite designers in DigiLand. I've got a few links for new freebies, too. The first two pages are my own. I thought I'd try out inserting one large photo in the many photo spots to see how that would turn out and, WOW! I love it. Give it a try yourself? I'll briefly explain how I did it in PSE. I highlighted all of the grey photo spots, removed the layer style then merged them and clipped in my photo. It was SO easy to do. I wanted all of my matting to be the same color. Otherwise, it might look too busy with the already busy background, so I did the same thing. High lighted all of the matting, ditched the shadows and merged. Boy, is that a huge time saver! Just don't forget to add your shadows back. I used Kim Cameron's kit, Coastal Wanderer. Here are some more pages from my very talented team. If you're thinking these templates look familiar, they coordinate with our mini scrapbooking kit that was a freebie. I even had a hybrid project using the journal cards. There are plenty of new releases out there this week. Check out these fabulous new goodies from LouCee Creations and Made By Keuntje. I went ga, ga over Lou's new kit, Mermaid Kisses! I think you can sea why. Hehehe...I used Made By Keuntje's really awesome templates, "Oh, Crab!" If you like making a scene, this kit is for you! I had way too much fun designing this page. Here is Lou's fabulous freebie! It will be available on Saturday! Both of these generous designers have coordinating freebiesto go with their new goodies. You can get the links by clicking on the images, below. Last week was SO busy! Here are a few pages I designed from last week that I think you'll really love. This is another template from Oh, Crab. I love how you can clip in the papers for the crabs. I used my kit, Soak Up The Sun. These are the templates from last week. So pretty, you could use them as quick pages. If you're a friend of mine on FB, then you've seen updated profile and wall pics. I used Aimee Harrison's gorgeous collection, Oceana. It was so great for my pictures from Spain. You can see how easy it is to make a few subtle changes to your page/profile pic and turn it into a pic that's great for your wall. I like when my pics coordinate. I changed the title, ditched the larger portion of the page and voila. Upload and position and you're set! Aimee has a fabulous coordinating freebie on her blog. Check it out! Cutie Pie Scraps asked if I'd scrap a few pages using her new kit, Soccer Player to coordinate with our Seriously Soccer templates. Seeing how my team is now OUT of the World Cup, I'm not nearly as excited. However, I'm glad to see Croatia in there. I'll be watching the final, will you? The papers in this kit are pretty great and all of the basic elements you need to scrap your soccer pics are in there, too. Kim Cameron has new templates and a kit in the Studio. Small Town U.S.A. is really cute. Just look at some of the fun elements in this kit. Pop over to the Studioand see some of the others. If you are a newsletterrecipient, then you just received the third, free template, today! If you're not a recipient, let's change that! Well, that was one heck of scrap-a-licious blog! I hope you enjoyed it and that we've inspired you to get scrappy, today. Thanks so, so much for making The Cherry a part of what I hope to be a fantastic day.